The Lumenzia luminosity masking panel for Photoshop has advanced rapidly over the past few years. The goals with Lumenzia v6 are more evolutionary than revolutionary. This is the largest update ever, with over 130 new features, updates, and bug fixes in total. Yet changes to the interface are extremely minimal, so as to avoid disrupting your workflow and allow you to benefit immediately. In short, your Lumenzia experience is improving, without having to think about it or learn new techniques. Lumenzia v6 is also featured extensively in my new Exposure Blending Master Course (and Lumenzia can be purchased for 50% off when bundled with the course). Numerous improvements to tutorials and their organization. 10+ legacy tutorials have been updated to show the latest interface and better clarify how to use some of the oldest and most important features in the panel. Lumenzia Basics now has a Tutorials button for reference material on how to use it. Zone pickers may now be used while viewing the new zone maps from v5. Saturation/Vibrance masks are now much faster and offer improved results. Dodge and burn the orange preview layers. With this approach, you are able to darken or lighten gray parts of the preview before you even create your mask. It’s a great way to control transition areas. This option can be enabled in the panel menu (see the written manual in the ZIP download for more details). “Sharp” now offers Deconvolution Sharpening. This type of sharpening greatly increases fine detail and is designed to help offset softness at the capture stage (lenses, anti-alias filter, etc). “Sharp” now offers High Pass sharpening as a Smart Object, so that you may work more efficiently and non-destructively. Dodge/Burn visualization. Select an existing transparent or gray Dodge/Burn layer and click “Dodge” to see the actual pixels, and then click Dodge again to clear it. Hue. <shift>-click “✓L” to view only the hue in the image. This is especially helpful for making color corrections and compositing. Saturation. <alt/option>-click “✓L” to view only the sauration in the image. This is especially helpful for making color corrections and compositing. Choose layer or vector masks at the time of creation. This replaces the previous general menu setting, and allows you to pick the option you need as you work. 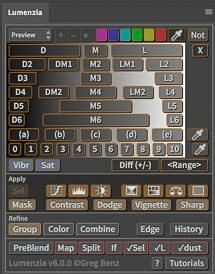 A new menu option to “Keep independent layer/vector masks when possible”. This allows you to easily try different layer or vector masks, without replacing both on the same layer. “Convert layers to linked PSB” has been substantially upgraded. You may now export and import channels and paths to and from an external PSB. CS6 support has been greatly expanded to include many features which were previously only available in the CC panel menu. This includes: paint on orange previews, convert layers to external PSB, the ability to permanently dismiss dialogs, Lumenzia Actions, and more. CS6 users should -click the Tutorials button to access these new features. Enhancements to the Basics panel, including a new Isolation feature to easily view a layer’s pixels without the distraction of other layers, masks, BlendIf, etc. And so much more, with over 130 updates in all. See the release notes for a complete list of all changes. Lumenzia v6 is available now and is another free update for all customers. Update links have already been sent to all customers via the email addresses used for purchase. If you need help to find yours or request a new one, please visit the Lumenzia Updates page.